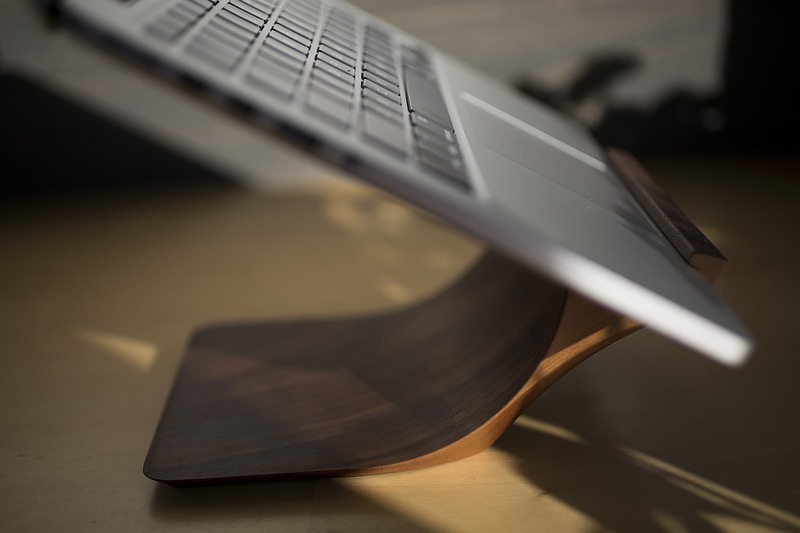 The Yohann Wood MacBook Stand is artful and sturdy. 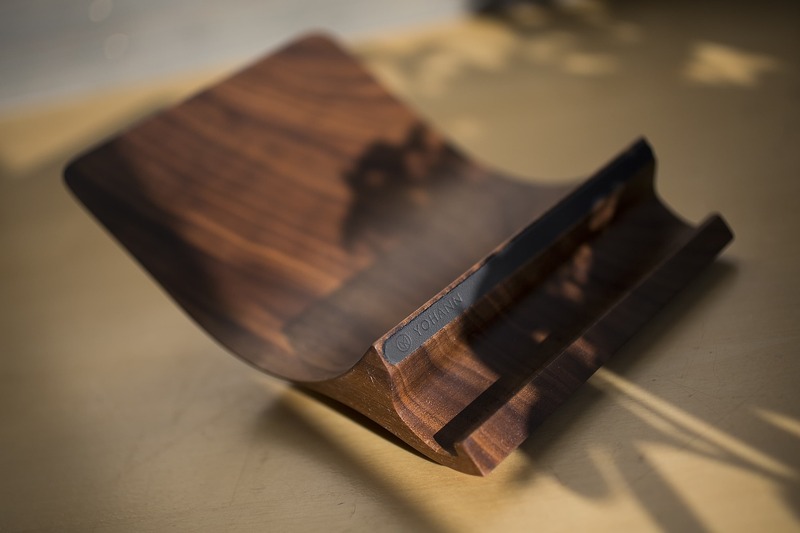 In German, the boy’s name “Yohann” means “gift of god.” The same could be said about the Yohann MacBook stand, a sculptural walnut base divine in both look and function. You may want to say a little prayer when you place your MacBook Pro on this elevating perch for the first time, though. You will wonder how this thing can support your rather expensive machine. Looking at a picture doesn’t exactly fill you with faith, either. It looks tippy, like a precariously balanced Alexander Calder sculpture. A device of utility should not take the role of delicate piece of art. The best view and, initially, the most nerve-wracking. Well, there’s nothing delicate about the pairing. Together they are strong and solid. 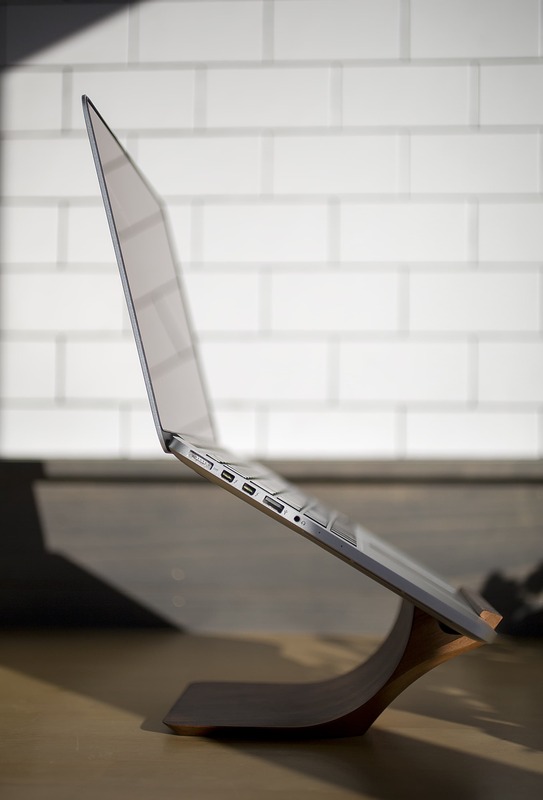 You dock the Yohann stand by opening the laptop and placing the bottom front edge in the Yohann’s support. With guided hands, recline the stand into its ready position and you’re ready to work. You can close your screen for sleep mode and the stand will continue to support the MacBook. 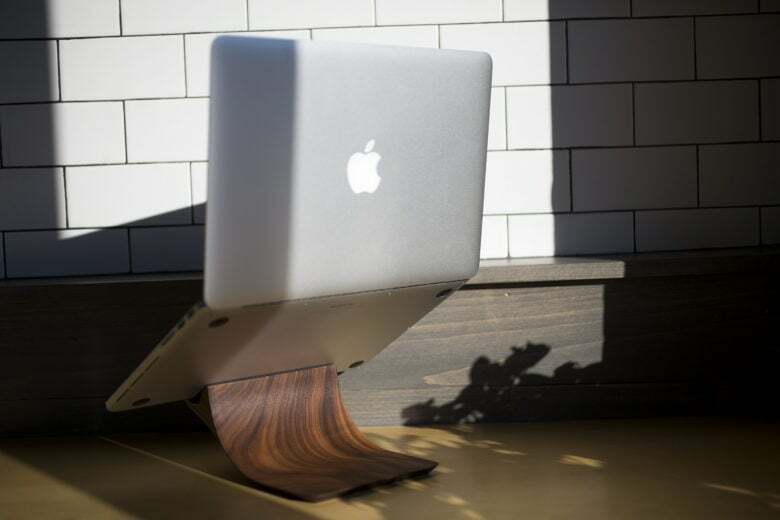 The walnut MacBook stand is engineered from a single block of wood (an oak version is also available). The stand’s structural calculations mesh with the laptop’s weight, dimensions and center of gravity, creating balance and stability. Desktop stands serve an ergonomic purpose. Elevating the screen pulls the body out of its stoop and straightens the back. The Yohann stand is ideal when using a second keyboard or, as I discovered, working from a standing position on a slightly higher surface. Pro tip: Do not lean on your computer with the force of your weight. The Yohann stand is solid but not made to support the user. With the front bottom edge of the MacBook in the support, the stand reclines into position. It was designed to fit the MacBook, MacBook Air and the MacBook Pro. While my 2015 MacBook Pro looked like the Yohann’s svelte soulmate, the stand was also magnificent in its support of my heavier, thicker 2012 model. Yohann is part of a design studio in Basil, Switzerland. Yohann’s founder, architect Berend Frenzel, is an Apple enthusiast and early adopter of the iPad. He searched for an iPad stand. When he did not find one, he designed one himself and funded it on Kickstarter in 2014. Architects stake their reputation on creating structures that are stable and remain standing. This bolstered my faith in the Yohann MacBook stand, which brings the same beauty and functionality to Apple’s unibody aluminum laptop.